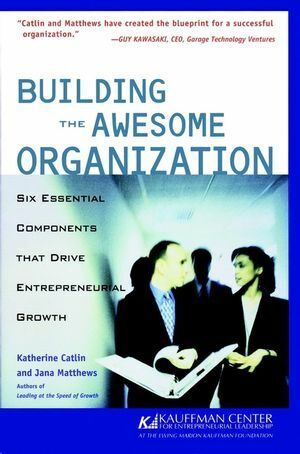 Building the Awesome Organization discusses the eight components of an awesome organization. This book will help you to realize the core competencies for growth. It describes the processes, policies and systems that support growth. Find out how to attract and retain awesome peoplea and develop an environment that motivates and empowers people to achieve extraordinary results. Explore the responsibilities of the leader and the expectations others have of the role that the leader of an entrepreneurial company will play. For the past 15 years, Katherine Catlin has helped CEOs and theirexecutive teams manage the challenges of fast-paced growth. She isthe founding partner of The Catlin Group, a consulting firm thatworks with entrepreneurial companies nationwide. Jana Matthews is president and CEO ofBoulder Quantum Ventures, afirm that helps CEOs and their top teams unlock their company'sgrowth potential. Matthews was the architect of many high-growthprograms at the Kauffman Center for EntrepreneurialLeadership. The Kauffman Center for Entrepreneurial Leadership Launched in 1992by Ewing Marion Kauffman to provide opportunity for otherentrepreneurs, the Kauffman Center for Entrepreneurial Leadershipis the largest organization focused solely on entrepreneurialsuccess at all levels. Funded by the Ewing Marion KauffmanFoundation, a not-for-profit organization, the Center offerseducational programs, initiatives, and partnerships aimed athelping youth, college students and adults who want to learn moreabout entrepreneurship and growing their companies. 10. In the End, It's Up to You. Appendix A: Glossary of Growth and Organization-BuildingTerms. Appendix B: Stages of Growth and the Leader's Roles. Appendix E: Examples of Mission, Values, and VisionStatements. Appendix F: Helping Build Your Company's Profit Spiral? (TM).